My warm, protected back deck has proved to be a nurturing environment for miniature citrus trees. I have a calamondin…3-feet tall with shiny green leaves and vivid orange orbs the size of cherry tomatoes. One chilly December day I noticed a 20-foot calamondin in the gardens of the Madrona Manor near Healdsburg. The gardener told me the tree was full grown when he started working at the manor 25 years earlier and it never fails to be packed with brilliant fruit all winter and spring. 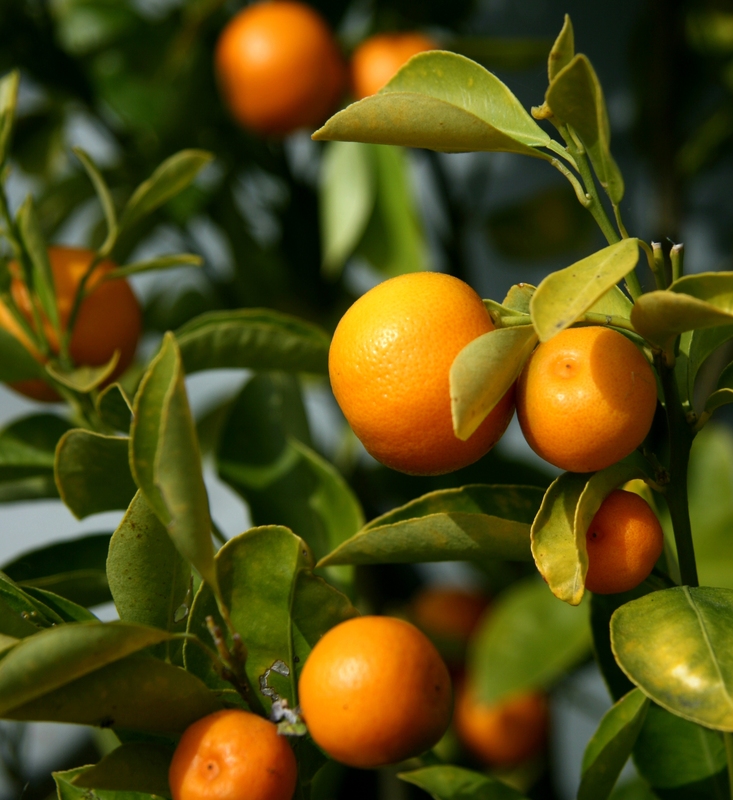 Calamondins are among the most flavorful small citrus fruits, but they are not easy to love. They are seedy, with a bitter rind and a tart juice and don’t lend themselves to eating out of hand. Madrona Manor’s restaurant uses calamondins as plate garnish. With a little research I discovered this tiny citrus does have a culinary background. Grooves were planted in Florida during the early 1900’s and the fruit was used as a flavoring for marmalade, cakes and glazes. But the tiny Calamondin yields so little usable pulp that it is labor intensive. I found references to “special occasion” calamondin cakes that seemed to peak in the 1950’s, before so many women left to work outside the home. I use my Calamondins to give a juicy spike to cocktails made with orange vodka, Cointreau, Aperol and orange bitters. And I found the following cake in the recipe archive of a local Florida newspaper. The taste is beautifully sweet-tart, with the unique bright freshness of calamondin puree. Make calamondin puree by cutting fruit in quarters, removing seed and running it through blender or food processor until very smooth (about 2 minutes). In a large bowl blend the cake mix, dry gelatin, milk and ½ cup calamondin puree (reserve the remaining 2 tablespoons for the glaze). In a separate bowl beat eggs, oil and lemon juice together. Stir into the bowl of dry ingredients. Pour into oiled and floured 10x4x 1/2-inch, angel food or Bundt cake pan. Bake in preheated 350 degree oven until a sharp knife comes out clean, about 40 minutes. Cool cake in the pan for 15 minutes. Run a knife along the side and carefully remove from pan, placing the cake onto a cake platter. Cool just to room temperature and spread with glaze. Combine all ingredients into a thick icing and spread on the just cooled cake without delay. If the cake is too warm the icing will drip off and not stick. But too cold and it won’t spread nicely. Use the icing as soon as it is made as becomes too stiff to work with after a few minutes. Place a pecan half over each serving or sprinkle with roughly chopped hazelnuts or walnuts. 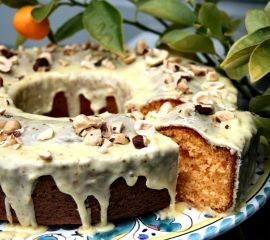 I have just discovered a calamondin tree in the garden and have decided to make the cake from the recipe you found. As I am living in New Zealand, I am wondering whether the packet size of our cake mixes (340 grams) is the same size or smaller than the ones you buy in USA and whether I will need to adapt this recipe accordingly. Hi Janet. American cake mixes became smaller in about 2012. The original recipe was used with an 18.25 ounce mix, I made it with a 15.25 ounce package mix and loved the results. I think The amounts of Calamandren can be flexible, as long as you match the liquid specified by your mix. The American 15.25 ounce packaged cake mix is about 430 g. Hope you give it a shot and let me know how it worked. By the way, New Zealand is one of my favorite countries. Hi. Thanks for your response and taking the time to help me with this. I have updated my recipe with these amounts and will use this next time I make the cake. New Zealand is a lovely place. Have you visited it much? I haven’t made it to USA yet but have a very long list of all the places I want to see eventually. Janet, We have been to N.Z. a couple of times and have good friends in Auckland and Nelson. I met one long time friend in France in 1994 and we continue meet up when traveling about…in New York, Istanbul, Paris and Amsterdam (she lives in England now). We always have the best time. Glad you are a clever cook and can work on getting the proportions in your calamodrin cake just right.